If you have a calculation that you frequently use in SQL queries you're probably bored of writing out the same code time after time. Why not try creating a user-defined function to save you the hassle? This blog teaches you how to define your own custom functions, including how to use input parameters, how to alter a function after you've created it, and even how to use fancy programming techniques such as variables and IF statements to help structure complex sequences of calculations. This blog is part of our long and detailed online SQL tutorial. Another way to learn SQL is on one of our SQL training courses. There are two main ways to create a user-defined function in SQL Server Management Studio: you can write one from scratch; or you can use a template. 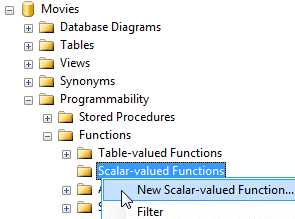 Every database will have a Scalar-valued Functions folder. To add a new function to it, right-click the folder and select the option shown. A scalar-valued function is simply one which returns a single value each time it is called. Once you've clicked the New Scalar-valued Function... option shown in the diagram above, you'll be presented with a wonderfully intuitive (ahem) page of system-generated code. This is just a small portion of the full template that is generated. In theory it's possible to modify the code on this page to define your own function, but I'll admit that I've not once done this! Instead, I prefer to write my functions from scratch, as described in the next section. Look for the New Query button in the top left of the screen. Beginning your function names with the letters fn is a useful way to distinguish your custom functions from the built-in functions in SQL Server. Once you've given your function a name you can then list the input parameters, or arguments, that your function will have. It's up to you whether you do this on one line or across several, but you must make sure to enclose the parameter list in a set of parentheses and separate individual parameters with a comma. All parameter names must begin with an @ symbol. Our example function has just a single input; the date that we want to format. The data type of this parameter is DATETIME. Our example function will return a string of text and, as we don't know how long the text will be, we've used VARCHAR(MAX) as the return type. --Our function code goes here! Now we're ready to start writing the logic of the function within the BEGIN and END block. And that's it! All we have to do now is execute the code to create the function and then use it in a query. All of that is explained in the next part of this blog series.